Still today, Nubia is synonymous with a mysterious and faraway land through which the River Nile runs, a land that leads the way into Sub-Saharan Africa, its riches and its exoticism. While without writing for millennia, Nubian civilisation displays remarkable dynamism and originality, culturally as well as economically. Kerma is one of the most important sites of the Nile Valley. Under excavation by a Swiss team for more than thirty years, it has revealed exceptional archaeological remains, monumental temples and vast necropoleis buried in the ruins of ancient cities. Kerma is the capital city of the first kingdom of Nubia. The region, which includes the oldest cemeteries of the African continent, also boasts the discovery of statues of the Black Pharaohs. 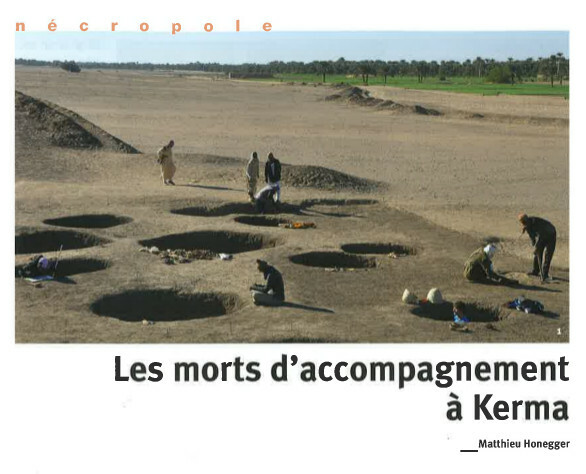 New publication: Les morts d'accompagnement à Kerma. Archéologie suisse, 40, 3, 2017.